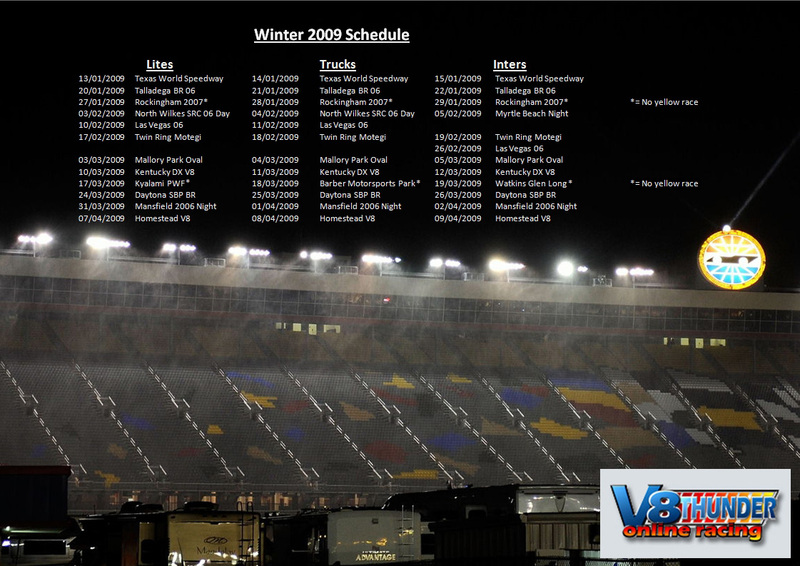 The following is the schedule for the winter season. There are several major changes this season, with a brand new track to V8 to open the season. There are also 4 other brand new tracks to V8 Thunder, plus several that have only been used once. The mid season break remains, however this is a few weeks early in Inters due to a clash with the Gatorade Duel. 13 Jan 2009 Texas World Speedway 2007 Race 1: 20 Laps - Race 2: 50 Laps. 20 Jan 2009 Talladega BR 2006 Race 1: 19 Laps - Race 2: 38 Laps. 27 Jan 2009 Rockingham 2007 Race 1: 34 Laps - Race 2: 51 Laps. 03 Feb 2009 North Wilkes SRC 06 Day Race 1: 30 Laps - Race 2: 60 Laps. 10 Feb 2009 Las Vegas 2006 Race 1: 27 Laps - Race 2: 54 Laps. 17 Feb 2009 Twin Ring Motegi Race 1: 27 Laps - Race 2: 54 Laps. 03 Mar 2009 Mallory Park Oval Race 1: 25 Laps - Race 2: 50 Laps. 10 Mar 2009 Kentucky DX V8 Race 1: 30 Laps - Race 2: 60 Laps. 17 Mar 2009 Kyalami PWF Race 1: 15 Laps - Race 2: 30 Laps. 24 Mar 2009 Daytona Night SBP BR Race 1: 20 Laps - Race 2: 40 Laps. 31 Mar 2009 Mansfield-Night 2006 Race 1: 25 Laps - Race 2: 100 Laps. 07 Apr 2009 Homestead-Night V8 Race 1: 27 Laps - Race 2: 67 Laps.